We are pleased to announce that the SlugCrew Major Reward for 2014 has gone to his limited print run! If you have already qualified for your Major Reward this year, you can expect to find this timid little fellow showing up in your mailbox this month! And if you haven’t earned him yet, keep reporting! 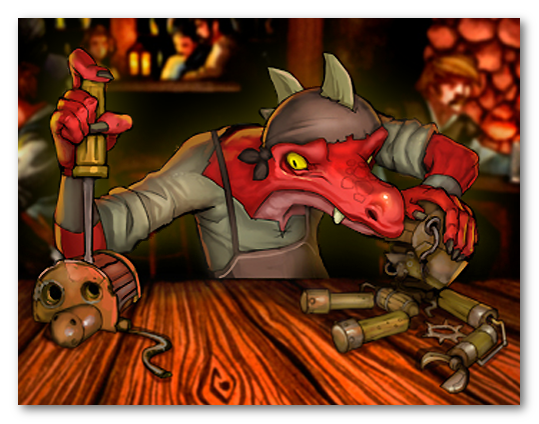 This little kobold is a blast to play and is our most ambitious character yet! 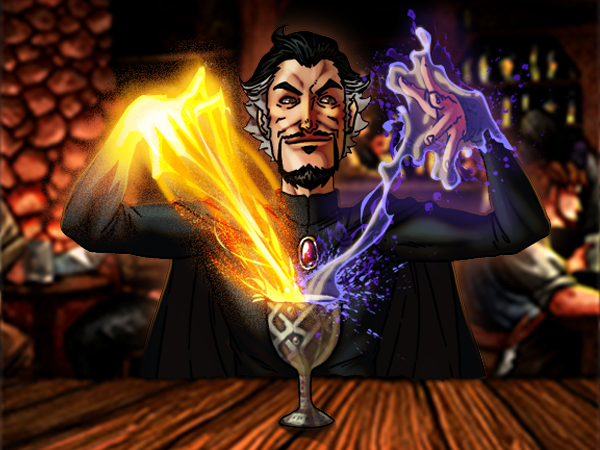 SlugFest Games is proud to announce the first of our Red Dragon Inn: Allies for 2014: Ozrik the Adept! Ozrik is a powerful elementalist with the ability to burn cards from his hand to bolster the effects of cards which he is playing. Don’t need that Gambling card or Ignore Drink? 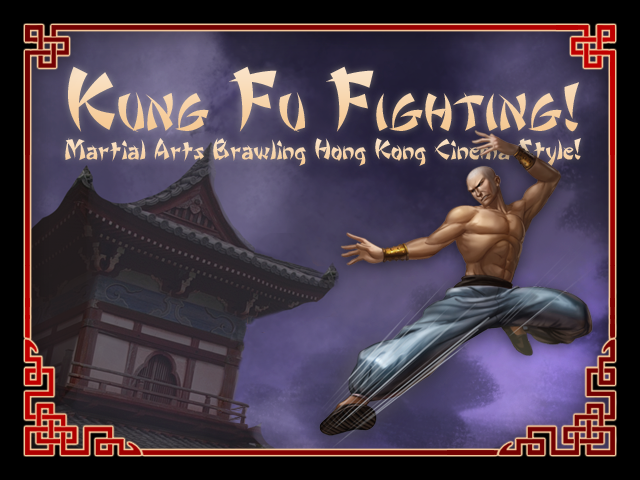 Burn them on your Action to really beef up your attack! The tricky thing, however, is that Ozrik can’t just burn any cards he wants. He’ll need to discard color-matched sets for bonus he wants to get. 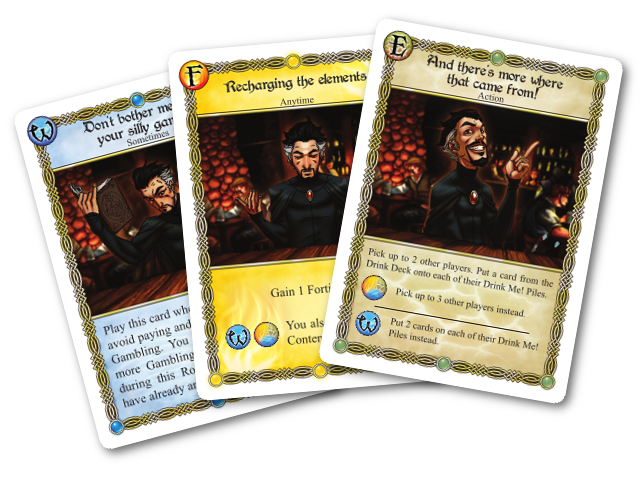 To help him manage his hand, Ozrik also introduces a heavy reliance on a mechanic that has been fairly rare in Red Dragon Inn: Card Draw. 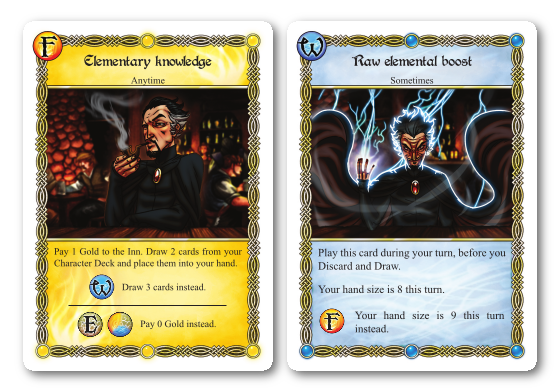 Many of Ozrik’s abilities allow him to draw additional cards so he can try to tailor his hand to the combos in his deck. All of this power comes at a dire price though! Ozrik is absolutely terrible at gambling. He has, in total, five Gambling cards in his deck! So if players decide to throw down across multiple games of chance, you’ll see Ozrik scrambling to conjure up as much emergency gold as he can muster! Ozrik was our first character released early to our demo team through the SlugCrew program, and they can tell you he’s a lot of fun to play. 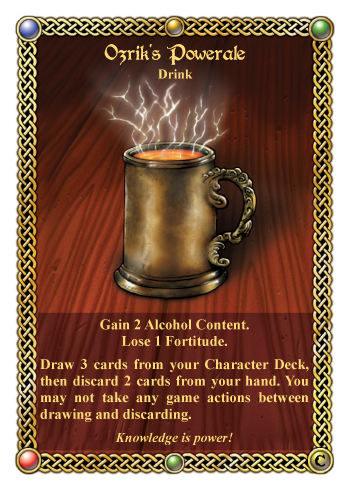 Like all of our Allies Ozrik is an advanced deck that provides you with a brand new mechanic that seriously changes how you have to approach playing The Red Dragon Inn. You can find out more information, and find Ozrik’s rules on his product page. Kaylin heard her father’s voice echoing through her head and began to cry. In the week since she had left The Grove, she had had numerous lessons in exactly how indifferent the big world could be to a little pixie. It’s well known among the few outsiders who have interacted with pixies and their culture that a pixie’s hair color is determined by their birthday. For example, spring pixies have green hair, summer pixies are bright blond, fall pixies are redheads, and winter pixies’ hair is purple or dark blue. It is also believed that a pixie’s temperament is determined similarly. Spring pixies tend to be bright and joyous, summer pixies are enthusiastic and excitable, autumn pixies are calm and peaceful, and winter pixies are cerebral and introspective. An interesting point must be made here. Since pixies value happiness and community above all else, they would generally plan to have their children in the spring or early summer. Over the centuries, winter births became rare, and then finally unheard of. The practice became tradition, and no one bothered to question it. Not all births can be meticulously planned, however. Kaylin’s parents had married in the spring. With all the babies being born, and with both of them being of a summery temperament (blond hair, enthusiastically cheerful, occasionally flighty), they threw caution to the wind. Tradition was forgotten. What’s the worst that could happen…? they thought. And so Kaylin ended up with that most inauspicious of birthdates, the winter solstice. Kaylin started life as an outsider. Her blue-black hair drew amazed stares from other pixies, even as an infant. Her parents became concerned when Kaylin began displaying some rather un-pixie-like tendencies, such as preferring to play by herself and asking about the world beyond of The Grove. The more her parents tried to mold her in the “normal” pixie image, the more Kaylin rebelled. By adolescence, Kaylin had developed a reputation throughout The Grove as being odd and sullen (at least, by pixie standards). She spent most of her time reading old books to study pixie magic and learn what little she could about the larger world beyond the borders of The Grove. Kaylin’s parents worried for their reserved, bookish daughter and just wanted her to be happy. So they truly believed that they were doing Kaylin a favor when they arranged for her to be married to the youngest son of a nice, normal family. “So there are more things in my life that you’ll be planning out for me? No thank you!” Kaylin stormed into her room and slammed the door. As she overheard her mother crying and her father talking in muted tones trying to comfort her, she knew what she had to do. She loved her parents and did not want to hurt them, but they simply did not understand her! She packed a satchel of essentials and waited until nightfall. That night, as she approached the front door, she heard her father’s voice from the shadows in the sitting room. “Kaylin, why do you need to be so different?” he said. Kaylin was taken aback by her father’s tone. She had never heard him raise his voice nor utter an unkind word, and the fact that he did so now frightened Kaylin. But worse, she felt guilt that she was the cause. She knew with absolute certainty that if she stayed there was no way for things to get better… in fact, they would definitely get worse. This strengthened her resolve. It was not fair… A tear rolled down Kaylin’s cheek as she stepped outside and closed the door behind her. Now she was in the forest, in the rain, convinced that she had made a terrible mistake. Surviving in the larger world was turning out to be much harder than she had anticipated. She had had trouble scrounging for food, she had no one to talk to, and she had even had to fend off an attack from a crow looking for an afternoon snack. The rain made flying difficult, so she sat beneath the toadstool and replayed the interaction with her father in her head for what seemed like the millionth time. The rain was starting to let up, but she was still hungry, cold, and alone. She hugged her knees to her chest and pondered her options… none of which seemed all that good. A snuffling noise nearby shook her out of her melancholy and set her on edge. Although Kaylin knew enough magic to defend herself, her wet wings meant that her mobility would be limited. A large gray snout sniffed closer to her hiding place. Kaylin noticed that the snout was attached to a rugged-looking wolf. Upon noticing Kaylin, the wolf looked at her curiously, as though he had never seen a pixie before (which seemed quite likely to Kaylin). “Uh, hi there,” said Kaylin to the wolf, who responded by wagging his tail. “Looks like you got separated from your group. I can relate,” she said. It felt good to have someone to talk to, even if it was an animal. The wolf settled down next to Kaylin. He did not smell too bad. Kaylin suddenly felt a little less alone and considerably warmer. The animal showed no signs of wanting to find its own kind as he traveled with Kaylin for the next several days. In the process, she decided to start calling him Wulfric, primarily because it sounded better than “hey wolf”. Kaylin told Wulfric the story of how she came to be out in the big world. Wulfric listened politely, enjoying the attention from his new friend, but giving no indication that he understood anything that she was saying. A few days after they had met, they came to the outskirts of a small human town. Kaylin’s first instinct was to flee and hide in the forest, but she knew that if she were to live outside of The Grove, she would need to start interacting with the “larger folk,” as they were referred to by pixies. Kaylin paused as she considered how to go about making some new friends, or at least some helpful acquaintances. Wulfric suddenly began sniffing the air and panting excitedly. He trotted off toward the town. Kaylin followed at a safe distance, trying to stay out of sight. She was pretty sure that few humans had ever seen a pixie, so she also knew that they would likely respond to such an encounter with fear–or worse. Wulfric stopped outside of a house with delicious smells emanating from it. He barked a few times in an attempt to get the attention of whoever was inside. An old lady opened the door and showed some generosity by offering Wulfric a tray of water and some scraps of meat. Kaylin decided that the old lady’s display of kindness meant that this would be as good a person as any to reveal herself to. She slowly flew forward toward Wulfric while he happily munched on his scraps. The old lady saw Kaylin, cried out in fear, ran back inside and slammed the door. A few moments later, a tall young man emerged from the house across the road. “Gran? Gran, are you all right?” he called breathlessly. He saw Kaylin and froze. He started shaking. “Ah…ah…are you a pixie?” he asked Kaylin. “Um, yes,” she said. She was pretty nervous about the whole situation herself, but concealed it as well as she could. Wulfric looked at the young man for a few moments, decided that he was not a threat, and went back to his scraps. “Aren’t you going to put me to sleep?” asked the young man, terrified. “What?” she asked with genuine confusion. The young man nervously informed Kaylin that the common food storage barn on the outskirts of town was “haunted”, and that a reward was offered to anyone who could solve the problem. Kaylin decided to investigate, Wulfric in tow. When they arrived at the building, a little surreptitious sleuthing by Kaylin confirmed what she suspected–there was nothing haunted about this barn. It had simply become home to a small group of opportunistic goblins. Kaylin noticed the makeshift “camp” they had set up near the back door, complete with fire pit, sleeping blankets, and totems representing the various deities and superstitions that this particular group of goblins adhered to. She counted four goblins seated near the fire and decided that clearing them out would be a simple matter. She retrieved Wulfric from his hiding spot and they waited out of sight just inside the entrance to the building. Kaylin decided to try a little bit of deceptive magic first. She used a simple telekinesis spell to lift one of the totems and float it around the fire pit in full view of the goblins. All four jumped to their feet, and two ran out the back door and into the nearby forest. That’s when nine more goblins jumped down from the rafters. Kaylin silently cursed her sloppy reconnaissance work and wondered if she had bitten off more than she could chew. She still was not sure whether Wulfric would stand his ground or run at the sight of danger. The closest goblin gave an evil chuckle and came at Kaylin with a club. She cast a quick spell to set the goblin’s head on fire. His chuckle turned into a pained scream as he ran away from Kaylin and out the front door. Two more goblins came from the left but were tackled by Wulfric before they could get too close to Kaylin. One ran away as the other was eviscerated by Wulfric’s claws. When the goblins saw their friend being torn apart, they became much more cautious. This bought Kaylin some time to work a sleep spell. That took down two more. Wulfric was staying close by in an attempt to protect her, but by this point, the goblins had them pretty well cornered. Wulfric continued to snap at any goblin that attempted to approach them, but one of them managed to nick him with a spear, drawing blood. Wulfric fell back a bit but continued to growl menacingly. Kaylin knew that they had to try to break the standoff, so she started focusing herself for one decisive attack. She floated just above Wulfric’s head and said “Okay Wulfric, get ready to pounce! One, two, three!” She let loose a forceful blast in all directions that knocked the remaining goblins off their feet. Wulfric took full advantage of the situation, leaping forward in a tornado of teeth and claws. His first target took a slash to the face before he even realized he had been knocked down. The second was disemboweled in a similar manner. As Wulfric snapped the neck of a third with his powerful jaws, the remaining goblins leapt to their feet and fled for their lives. 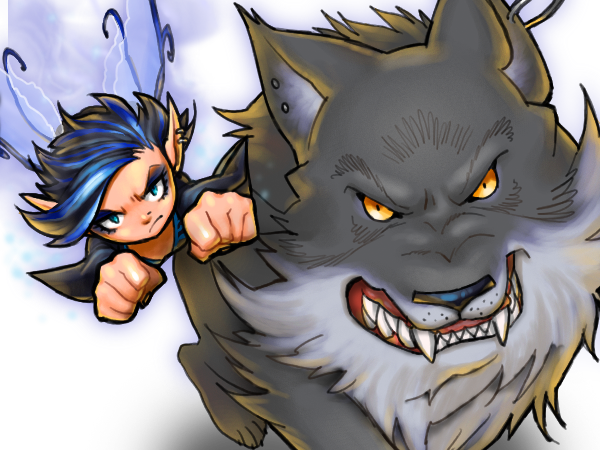 “Good boy, Wulfric!” Kaylin exclaimed breathlessly. Kaylin started to say “no,” but then stopped herself. She had read about adventurers in books back in The Grove. “You know, Wulfric, I bet we’d make a pretty good adventuring team,” she said. The young boy shouted out “Zot!” and then started running around pointing at things and saying “Zot!” over and over again. Kaylin had never heard of Greyport or The Red Dragon Inn, but their success against the goblins had filled her with a new sense of confidence and curiosity about the world outside The Grove. “Oh c’mon, Fiona, where’s the adventure in that?” asked Wizgille with a playful grin. Fiona just laughed and shook her head. The Party was about a week’s journey south of Greyport, off to their next adventure. They were following up on a tip from a mysterious merchant they met at the Red Dragon Inn, who said that there were some old forgotten dwarven ruins in the area that had become a powerful nexus of dark occult forces. In other words, it was the type of thing that The Party couldn’t possibly ignore. 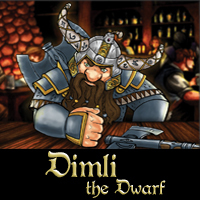 Dimli was acting as party lead on this particular adventure. Fiona and Eve were the combat support, along with Fleck, who also brought his usefully in-depth knowledge of history and lore. Erin was their healer, and Gerki and Wizgille provided the specialized skills that they all knew would come in handy while exploring dwarven ruins. The rolling plains they were hiking through gradually showed more and more signs of civilization–gnomish civilization, to be precise. The houses they passed were fascinating combinations of art, science and controlled chaos. At first glance, they looked like rather run-down country cottages, but as The Party approached, they saw that even the most modest of the cottages had noticeable pipes, gears and other artifices running up and down, and in some cases through, the walls. “Hey, Wizgille, didn’t you grow up near here?” asked Fleck. “Oh, I’m quite interested to see where you grew up!” said Erin. Wizgille started looking a bit uncomfortable. “Well, about that. There’s a road that will take us around the city rather than through it. It’ll save us half an hour, at least,” she said. “I must agree with our esteemed leader on that!” said Fleck cheerfully. Fiona and Gerki nodded enthusiastically, and even the often-dour Eve seemed intrigued by the possibility. As they rounded a bend in the road, they spotted a middle-aged gnomish man with two young children. When the gnomes noticed Wizgille, they suddenly looked awestruck. The two children started whispering excitedly to each other, and one pulled what looked like a well-worn periodical out of her shoulder satchel. The Party looked on amusedly as Liana slowly and nervously held out the periodical she was holding. It was entitled “Gnomish Inventors’ Quarterly” and there on the cover was a picture of Wizgille posing in front of her alcohol-to-gold transmutation device. “Holy Fillkh, Wizgille, it’s you!” exclaimed Fiona. “Yeah, I guess so.” Wizgille handed the autographed periodical back to the girl who handled it as though she were a cleric handling the holiest of holy relics. “Hey, we need to tell the others!” exclaimed Jona. Liana snapped out of her reverie and nodded vigorously. Both children ran ahead down the road. “Wait!” called the children’s father. He quickly tipped his cap and said “thank you, Lady Wizgille,” then took off after them. About fifteen minutes later, The Party arrived at the outskirts of Copperforge. Nearly every gnome they passed smiled and waved. Several cheered loudly. When Fleck smiled and waved back, they ignored him, much to his chagrin. As they approached the town square, they noticed that a sizable crowd had gathered. At the front of the crowd was a gnome who was somewhat more garishly dressed than the others. “Oh no,” lamented Wizgille quietly. The Party stood and gaped as Wizgille was hoisted up onto the shoulders of some of the stronger gnomes, while others closed around her and led her off to the nearby town hall. An elderly lady was one of the few gnomes left behind in the square. She smiled up at Fiona. “It must be a great honor to work with such an important inventor,” she said calmly. “Um…yeah?” said Fiona, clearly confused. The old lady looked aghast. “You mean you don’t know?” she asked incredulously. 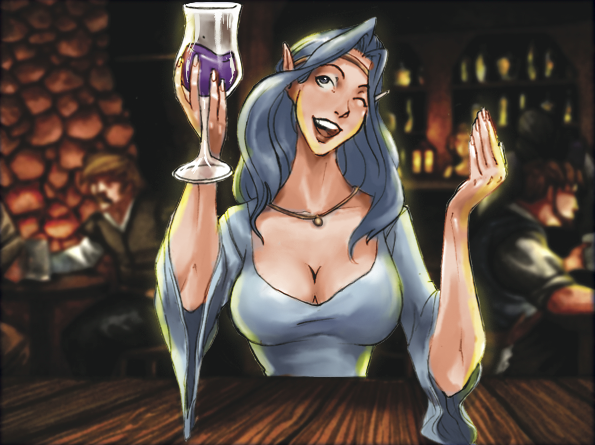 “Come with me and I’ll tell you all a little story.” She led them into a small tavern just off the square. Wizgille had not been viewed as a particularly gifted student when she enrolled at Copperforge Inventors’ College, but she had two qualities that served her well in her studies there. First, she worked hard (and didn’t need much sleep), and second, she had an unflappable optimism that was almost impervious to failure. While other students were questioning themselves, wondering if they really had what it took to be an inventor, Wizgille simply took failure in stride, brushed herself off (often literally), and tried something different. This particular personality trait meant that Arcane Invention was a natural fit for her. Arcane Invention, the art of blending engineering and magic, was not a particularly common subject for gnomish inventors to study, due to the high device failure rate and frequent dangers. Arcane inventors studied ways in which powerful magic crystals, talismans, and other artifacts could be used to supercharge inventions with abilities far beyond what they should, by all rights, have. Like most gnomes, Wizgille did not have any magical aptitude herself, but that wasn’t a problem. From her teachers at the Inventors’ College, she learned how to detect magic and harness it to power inventions of all kinds. She also learned that arcane inventions frequently failed, sometimes catastrophically, and that any especially powerful invention could be considered a triumph even with a success rate as low as 10%. Her Omnisight Goggles earned top marks during her final exams, and her career took off from there. Within a few years, Wizgille had become a prominent inventor–one who was known for taking on high-risk, high-reward projects. At the annual Inventors’ Guild conference only four years after her graduation, she introduced the world to her alcohol-to-gold transmutation device. Since very few arcane inventors had ever attempted anything so ambitious, her device was expected to be a mere curiosity with a vanishingly low success rate. But, like all devices displayed at the conference, it was subjected to rigorous public testing to see just how reliable it was. The device’s success rate of 26.2% left the testing panel of the Inventors’ Guild dumbfounded. They had never seen such a wondrous device work so often–or at all, for that matter! For several years now you have made me feel like the greatest inventor in the land. This has been both a blessing and a curse. I have learned a great deal, taught a bit, and acted as a role model to many. However, this has left me with little time to pursue my true passion: pushing the bounds of Arcane Invention. It is with a heavy heart, but firm resolution, that I announce my immediate departure from Copperforge to embark on an adventuring career. I plan to use my talents to fight evil, help people, and subject my devices to the most demanding test–real-world, life-or-death situations. I am eager to start on the next phase of my journey. I apologize if my decision disappoints or offends any of you, but I truly believe that it is only by using my inventions in real-world situations that I can make the best use of my skills. 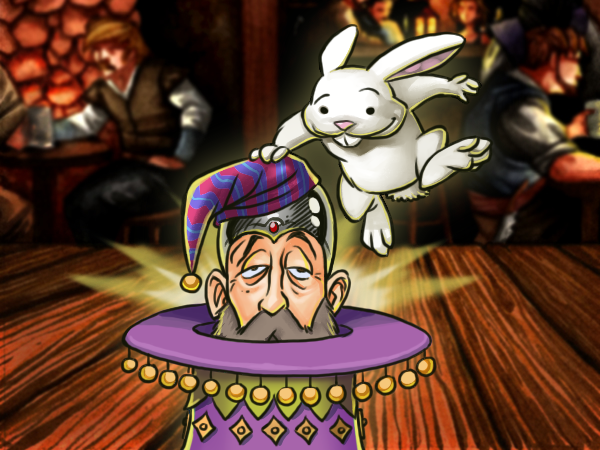 As The Party was finishing their food and drinks, Wizgille rushed into the tavern, causing a ruckus of cheering among the few gnomes who had chosen to be there rather than at the party at the town hall. Wizgille looked shell-shocked and exhausted. “Let’s get back on the road,” she said simply. The mayor’s party was still going on, and sounded like it would probably continue well into the night. The Party headed out of town in silence. As the buildings began thinning out, they noticed one with a well-lit outbuilding. In it, young Liana was tinkering away on a workbench that was adorably small, even by gnomish standards. She looked up from her work as the party passed. This time, she didn’t hesitate. She ran out to the road to talk to Wizgille. Wizgille noticed that the copy of Gnomish Inventors’ Quarterly she had signed was already framed and hanging over Liana’s workbench.